What was billed as a rally to support “Trump,” “Freedom,” “Constitutional Rights” and “this Great Nation,” never fully materialized Tuesday afternoon, but instead dissolved into a handful of confrontations and dialogues. A Twitter account, @TU4TRUMP, called for students to gather in Freedom Square at noon and, apparently, was able to send out a mass-email advertising the rally to a large portion of the University community. The person or people behind the Twitter handle have chosen not to identify themselves, despite multiple requests from The Towerlight. Nobody at the gathering claimed responsibility for organizing the event. A direct message on Twitter, sent to The Towerlight from the TU4TRUMP account. 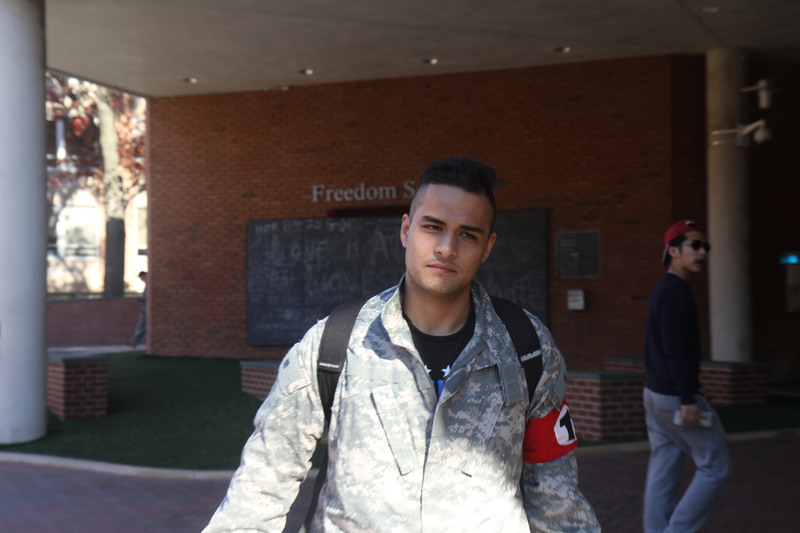 A student at a pro-Trump rally on Towson’s campus. 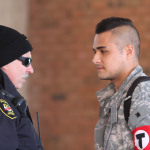 He was criticized by others for wearing a red armband with a black “T” in a white circle. Photo by Cody Boteler. A group of apparent Trump supporters. Photo by Cody Boteler. SGA Vice President James Mileo, left, and President Taylor James, right, at the pro-Trump counter-protest. Photo by Cody Boteler. Police at a pro-Trump rally. Photo by Cody Boteler. A TU police officer speaks with a student at a pro-Trump rally. Photo by Cody Boteler. A group of counter-protestors at a pro-Trump rally. Photo by Cody Boteler. 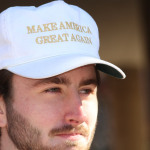 A man in a “Make America Great Again” hat at a pro-Trump rally on campus. Photo by Cody Boteler. 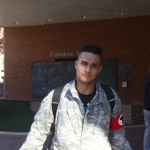 Many students at the rally confronted the student about his choice of outfit—from criticizing him for wearing an army jacket (the student himself said he never served) to denouncing his armband as a Nazi symbol. 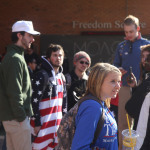 Student Government Association President Taylor James said it was “terrifying” to think that someone was so comfortable walking around campus wearing a symbol that, in her view, signified hatred. “That was like chilling, to know that he was that comfortable to walk around knowing how scared he was making people feel,” James said. 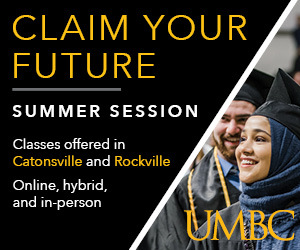 Ray Feldmann, a spokesman for the University, said, “under existing case law, wearing an armband is not disruptive to a school’s educational process. Therefore, the First Amendment protects the right of the student to wear it.” The University did not offer further comment. 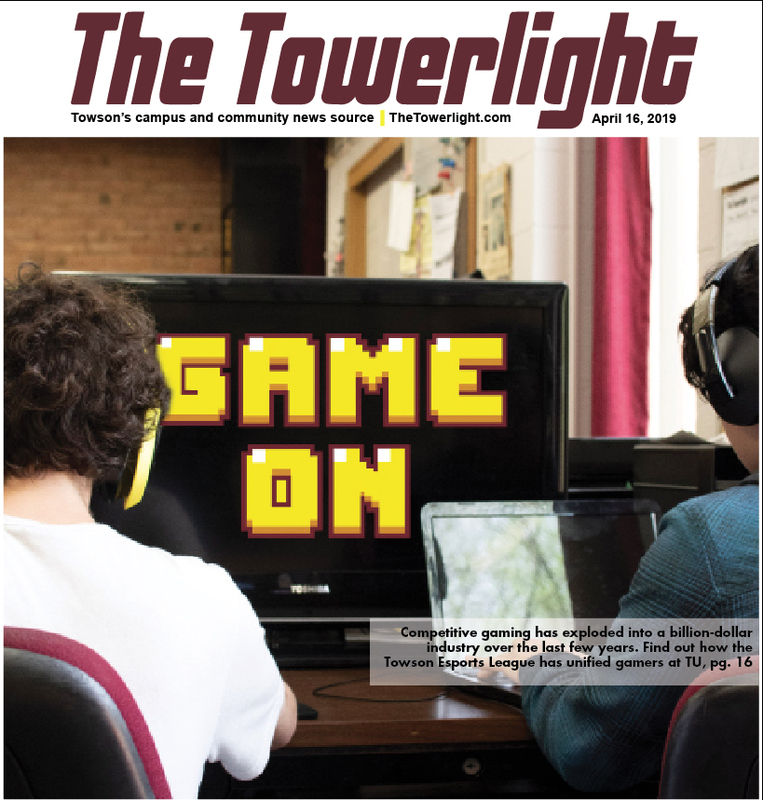 After seeing tweets from Towerlight staff about the student, several people have reached out to The Towerlight with claims that they have seen the student wearing the armband in other dicey situations on campus. 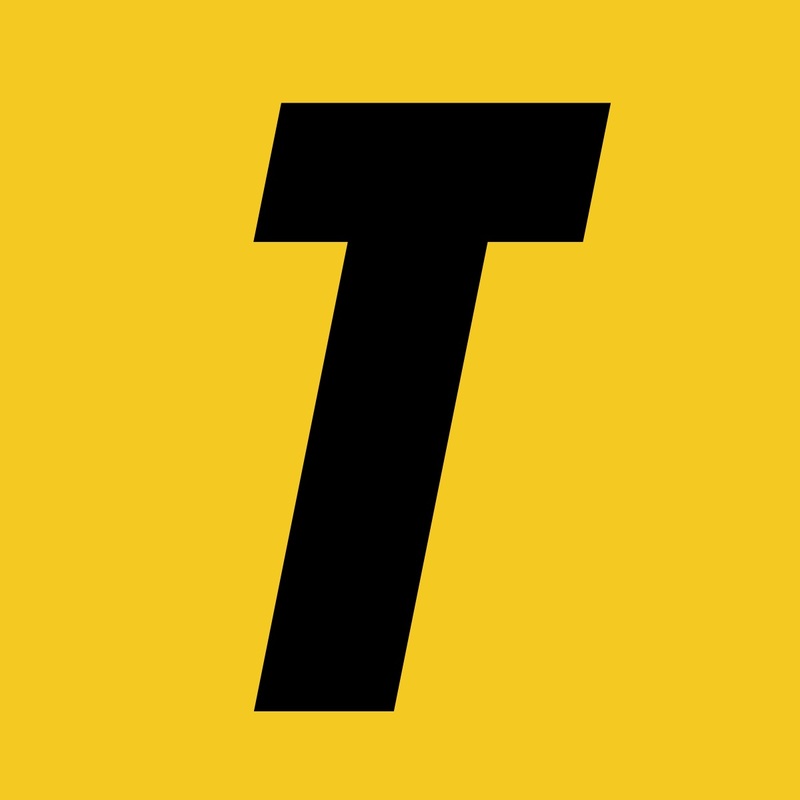 Sarah Kuczinski, a Towson student who identified herself as a former classmate of the student wearing the “T” armband, said she she saw him get “visibly angry” during a presentation she gave in class and that he “stormed out” at the end of that class one day last semester. Other students have posted online about their run-ins with the armband-wearing student but have not directly contacted The Towerlight. As the crowd began to grow, some students attempted to address the entire group. 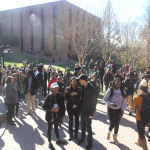 However, as nobody had claimed responsibility for organizing the event or worked with University administration to clarify what was occurring, TU administrators worked to stop students from addressing the whole crowd. 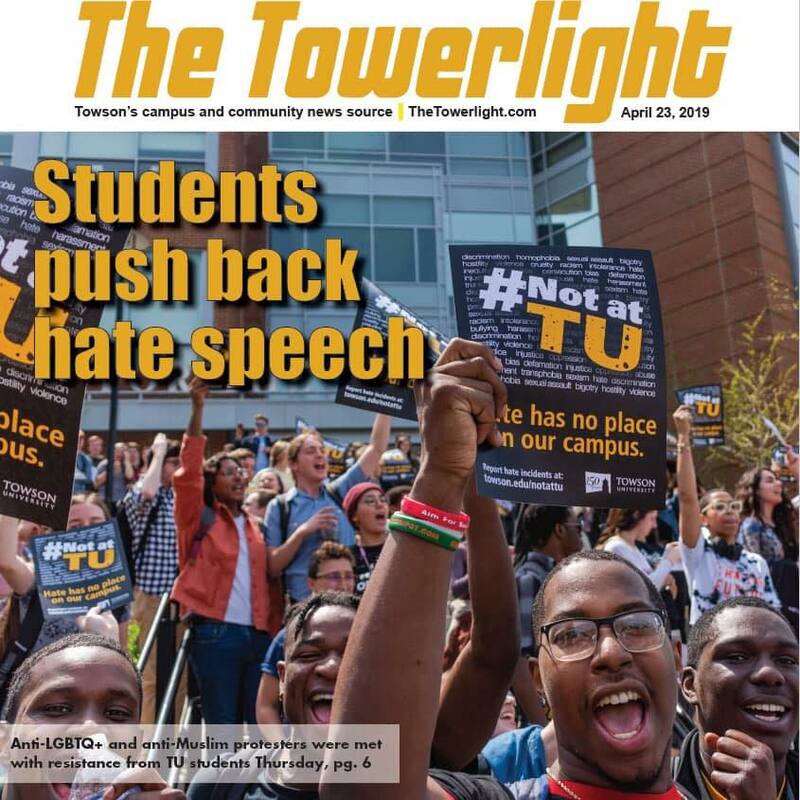 Vice President for Student Affairs Deb Moriarty said she acted in accordance with Towson’s “Time, Place and Manner” policy, which regulates where “expressive activity” can take place on campus. “Because somebody had planned a specific event [in Freedom Square Tuesday,] what I was trying to do was not to start a rally that was not planned,” Moriarty said. She added that the policies the University have in place are there, in part, for students to figure out “how to have a successful event” and to keep everyone safe. The crowd thinned as time passed and nobody stood up to take responsibility or to speak, but several students gathered and clumped together. 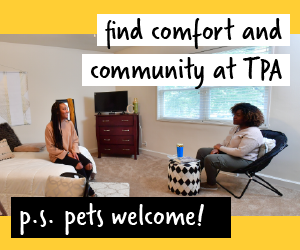 Some students took it as an opportunity to support a student initiative to designate Towson as a “sanctuary school,” while others began to actively engage with each other in conversations about the political climate. 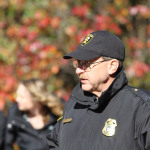 Eventually, James and other members of the SGA essentially wrapped up the gathering by saying they thought the conversations were no longer being productive.